Nishas world and baby Alisha: 26 month of Alisha, growing up so sweetly and innocently. Wanna play? Visit Kerchoonz.com right away! 26 month of Alisha, growing up so sweetly and innocently. Well its Alisha's monthly update and guess what? she 26 months now! very naughty and innocently cunning ;).. this month she had begun telling me the boo boo(the ghost) has taken away the remote, haha, when i want to watch my favourite channel on television! She is an animal lover, just like her aunt and whenever the cat which strays into our home in search of milk or food, shes like singing and dancing with her hands up in the air and says "kitty aya(came), kitty aya"! yeah in a cocktail of Hindi/English ;) and she lets the cat purr on her, plays with it, loves it! 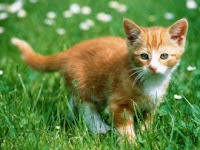 i wish i had a pet one for her, for the cat doesn't seem to come anymore :(..